State Bank of India is an extra ordinary Government Authorized bank in India. Actually SBI have huge number of branches in our Country and also it is a biggest bank group in our Country. Recently some banks are synchronized in SBI group there are SBH (State Bank of Hyderabad), SBM (Mysore), SBP (Patiala), SBS (Saurashtra), SBT (Travancore), SBI Indore, SBB (Bikaner) etc. Those banks are included in SBI Group on 1st April onwards. Coming to SBI Internet Banking Online Registration here we will provide brief explanation on it. In previous article we will explain PNB Net Banking Registration. SBI Personal Banking Registration is a good facility to give State Bank of India officials. Actually there are lot of facilities giving in SBI Net Banking Online Registration there are Online Money Transferring via IMPS or NEFT or RTGS, Online Fixed Deposit, eserivces, SBI Secure, Third Party Transfer, Inter Bank Transfer, SBI to SBI money Transfer, SBI to other bank transfer, SBI Reward Points Check, Link your Account to Aadhaar etc. SBI Mobile Banking: By using the SBI Mobile Banking / SBI SMS Banking you can use the above facilities. Generally who are using Smartphones those customers must install the SBI Freedom App. SBI Freedom Application will be available for both Android, iOS and Windows Phone users. While installing the SBI Freedom Mobile Banking App you can register by Send SMS MBSREG to 9223440000 to receive User ID, Default MPIN. After receiving the MPIN and userid you will activate your Mobile Banking account by using SBI Online Banking. 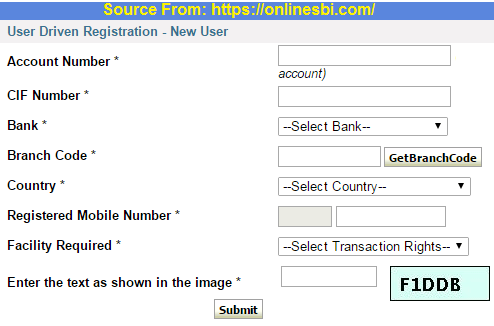 We will provide few instructions on How to Activate SBI Online Personal Net Banking Registration are as follows…. Enter your Account Number, IFSC Code, CIF Number (Printed on Bank Passbook), Registered Mobile Number within the bank, Select Country. Click on Submit Button. In the next step you can choose either Activate through Debit Card Details or Branch. Select Activation through Debit Card. Enter your Valid Debit Card Number, Expiry, Name on Card and CVV. You can get OTP. Enter it. Then you can get Temporary User ID and Password. By logging via Temporary User ID and Password it can ask again create User ID and Password. In the next step you can choose Profile Password. Enter your Date of Birth, Select Security Questions etc. Click on Submit Button. That’s it your registration will be successfully completed. I have 2 sb a/cs with SBI; one being my pension a/c and hence the other jt.name is of my wife; for which I have personal banking internet facility. please advise me what procedure I have to follow to have the 2nd internet account.